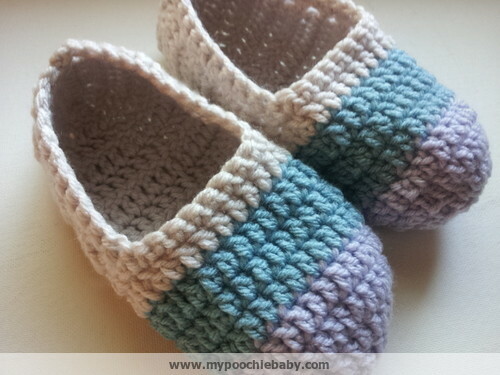 Free pattern for women's crochet ballet slippers/shoes. This is a very easy pattern and the shoes stitch up pretty quickly. I love making these in many different colors and I wear them all the time. These slippers make excellent gifts! This pattern post has moved! 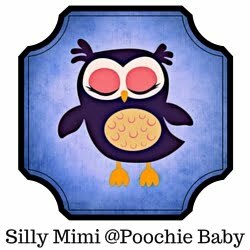 Click HERE to see the pattern on the new Poochie Baby blog. Thank you for posting this pattern. My friend's mother made a pair of these slippers for me over 25 years ago. I still wear them. 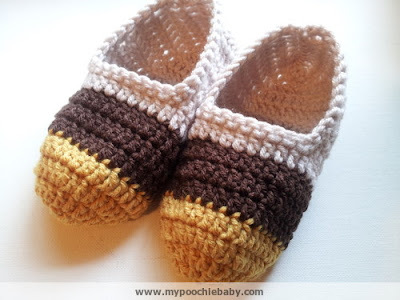 About 3 years ago I decided to crochet a pair for my children. I asked my friend's mother for the pattern and she wasn't able to remember it. So I decided to decipher the pattern by my self. For the most part I did, except for the number of rounds needed for size. Plus trying to look at a 25+ year old pair of crochet slippers is not always very telling. :) There were some issues. :D So thank you vey much for sharing this pattern. I can't wait to start! Your welcome!.... I have made myself several pairs and I wear them every day. I love the fact that I can make them match all of my PJs and lounging clothes. Could you tell me what row you started changing colors? Hi.. I changed colors for R6, R7 and R8. Then changed color again at R9 and used that color to complete the slipper. Thank you! I am working on my set now and love this pattern! How did you do the heel portion? 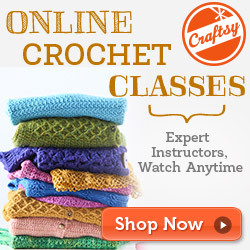 Did you just crochet around until the two sides met? Hi... the heel is sewn together. When you finish crocheting and tie off, leave a very long end. Fold the slippers together and using that long end and a tapestry needle, sew the two sides together. Is this regular worsted yarn or a bulky weight? What hook size? Hi... The pattern uses an F hook. And, I used "I Love This Yarn" from Hobby Lobby to make the slippers. It is a 4-Worsted weight yarn. So, row 10 should say "Ch 2 turn" at the end of it? To anonymous.... technically you do CH 2 and turn. But, most of the pattern lists the CH 2 at the beginning of the next row. To glitterqueen - I used "I Love This Yarn" from Hobby Lobby to make the slippers. I too got stuck on row 10 & had to pull up your site. Thanks to other comments and your answer my slippers i'm working on are coming out just fine. Thanks. I LOVE the Send to Kindle option, it is the first time I have seen this. Thanks for the great pattern can't wait to get started. Was looking for a good kids pattern for my 3, 6, 8, and 10 year old munchkins but came across this one so I might just have to make some for me too! Please let me know if you can suggest a good kids pattern. I tried to wing it but they ended up huge, lol. I am beginner ;-) Thanks from Muscat, Oman. nice i like it thanks!!! for size 6/7 dc back and forth for the sole up to row 25/26....trust me it fit me. Love the pattern, but will not buy anything from Hobby Lobby. Will find my yarn elsewhere. For those of you who do not wish to shop at Hobby Lobby, you can use Red Heart With Love yarn or Bernat Super Value. Those are both about the same weight and softness level of the Hobby Lobby brand. Thank you for the wonderful pattern. I love Hobby Lobby. "I Love this Yarn" is the best. Lovely pattern Michele, I wish we get the nice yarns in the UK as you have, yous colours are so nice. *R21 – 22 stitches worked: (check stitches) DC in first 8, DC2tog 3 times, 8 DC. (this will form a rounded edge on the bottom of the heel. Do not cut yarn. Sew up heel, with scrap piece of yarn, leave 4” tail for weaving in. They are super cute and the little shell at the back gives a little 'tab' to pull them up with. I love your color choices, too! Sherry... thanks for modification tip! I will have to try that. About the size question for a child.... If you have a little time on your hands, I would make a test slipper with a D or E hook, using the same pattern instructions..... See if that will make a small enough size. I personally have not tested the smaller sizes but I may do so in the future! Thanks for easy pattern, I'm not as experienced as these ladies, but I'm going to give these a try-wish me luck!